Over the weekend, we spent some time sitting at the beach reading. I always love an opportunity to sit outdoors and read, and when we go somewhere like Willows Beach, despite there being massive amounts of people there, it’s always less distracting than I expect it to be. 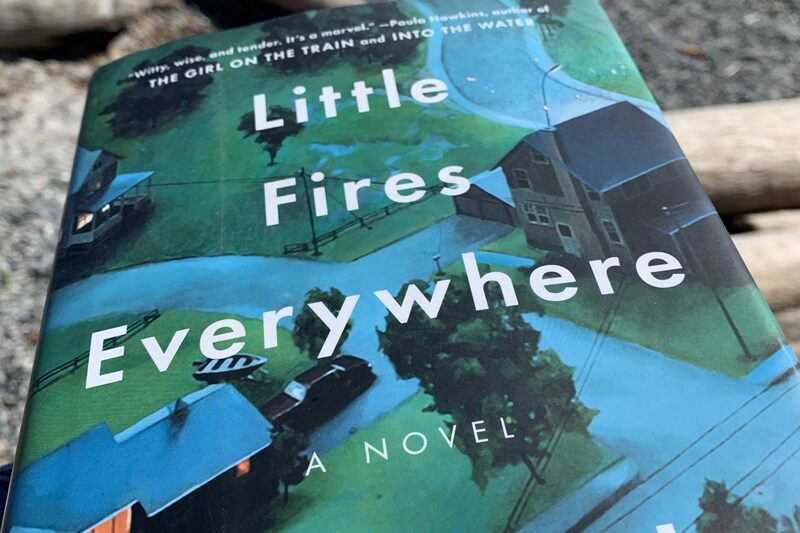 It’s certainly easy to concentrate on what I’m reading when the book is as good as Little Fires Everywhere. I’ve been keeping any eye out for the book forever, so I was thrilled to see it at Well Read Books (in hardcover for only $9.99!). I began reading, and from the first page, I was intrigued. Celeste Ng is a master at writing multiple characters in great depth. Each character had his or her own unique personality and identity, but they weren’t written in a way that made them “quirky” or seem like “the token ____ character.” I often think back to one of my favorite series as a child: The Baby-Sitters Club. As a kid, I loved it, but even then I couldn’t help but notice that the characters were very intentionally diverse, and not in a natural way-more in a “we are meeting quotas” kind of way. There was the Asian girl, the black girl, the redhead, the All-American tomboy, the nerdy girl, the popular blonde, and so on. Ng doesn’t do that. Each character is his or her own person, but in a realistic way. The plot is incredibly solid. In general, I like for things in life to be very black and white: this is the good guy, this is the bad guy, etc. This book makes that completely impossible. Is Bebe wrong for giving up her baby in the first place? Maybe, but that doesn’t make her a bad person; especially now, as she’s fighting for her child. Is Ms. McCullough wrong for trying to keep the baby, even though the mother wants her back? Maybe, but she could probably give May Ling/Mirabelle a more comfortable life. What matters more, a comfortable life, or the love of a birth mother? These questions are impossible to answer, and Ng doesn’t try. She does force us to question the status quo regarding families and identity and what determines who we are, as people. These are hard subjects to write about, but Ng does it with ease. I also want to note how proud I was about 60% of the way through, when I declared that “I’ve figured it out!” I predicted certain parts of the plot, and I’m typically weak with predictions. My husband mentioned, however, that my being able to predict the plot points to the author’s skill as a writer; people behave logically, for the most part, and you should be able to predict their behavior, to a degree. It’s a talented author who can allow you to put the pieces together slowly, as they arise, and still keep you reading to the very last page.